Our Indianapolis office is located downtown on the third floor of then Capital Center South Building at the northeast corner of Ohio and Illinois Streets. Ohio Street is an east-west street one block north of the circle. Illinois Street is one block west of the Circle and runs one-way north. Parking is available in the garage located below the building (entrance on Ohio Street). Take I-65 South to the Meridian Street exit. Travel south on Meridian Street to Ohio Street. Turn right (west) onto Ohio Street. Our building is on the right at the intersection of Ohio and Illinois Streets. Take I-65 North to the Market Street exit. Travel west on Market Street to Delaware Street. Turn right (north) on Delaware Street. Travel one block and turn left (west) on Ohio Street. Travel three blocks. Our building is on the right at the intersection of Ohio and Illinois Streets. Take I-70 East to the Illinois Street exit. Travel north on Illinois Street to Ohio Street. 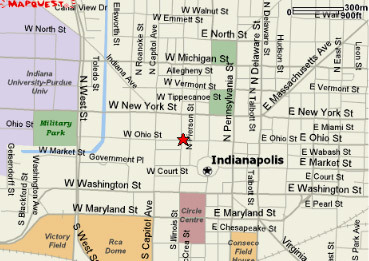 Our building is on the northeast corner of the intersection of Ohio and Illinois Streets. Take I-70 West to I-65 North to the Meridian Street exit. Travel south on Meridian Street to Ohio Street. Turn right (west) onto Ohio Street. Our building is on the right at the intersection of Ohio and Illinois Streets.